Jakarta. As plant-based cuisine goes mainstream, vegan chefs are letting their imagination run wild. Open up Instagram, follow the hashtag #veganfood and gorge yourself on mouthwatering (pictures of) pizzas, pies, (Beyond Meat) burgers, pancakes and ice cream made entirely from plants – no dairy, no eggs, not even honey (remember, it comes from bees). But where do you find these delicious animal product-free food in Jakarta, the land of deep fried chicken and slow-cooked rendang? 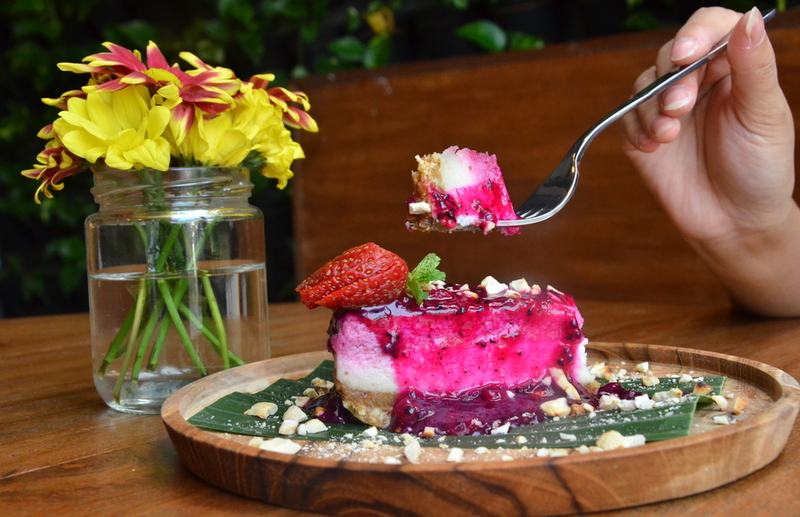 The Jakarta Globe tries on these four newfangled vegan restaurants for you. Bring your own wooden utensils and tuck in! 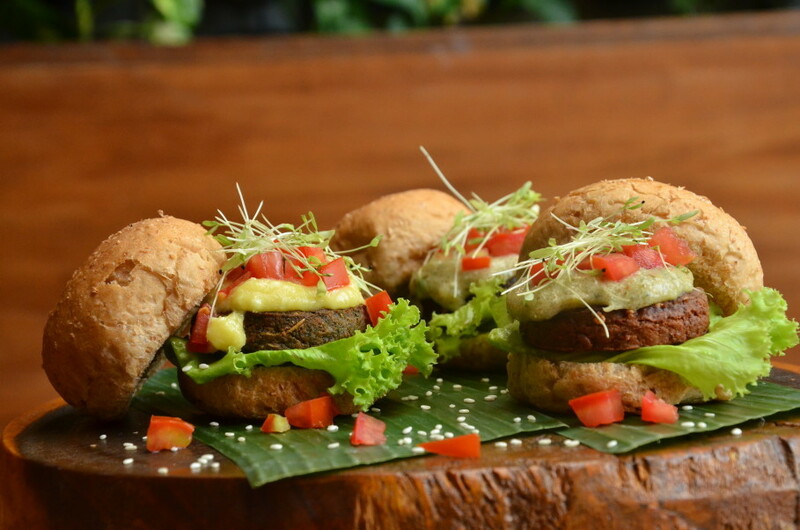 The brainchild of founders Max and Helga, Burgreens has been educating Jakartans about the vegan movement since 2013. They don't only sell vegetarian and vegan food, co-founder Max stresses the restaurant is a social enterprise as well. Burgreens sources local produce to support young organic farmers, gives market education through talks and movie screenings and their goal in 2018 is to be the first zero-landfill restaurant in Jakarta. If you're a first timer and don't know what to get from the menu, we suggest trying the mini burger trio, a sort of sampler for what the restaurant has to offer. It features three different patties: beans and cheese patty with a sprinkle of chili powder that gives it quite a kick, very dense mushroom and oat patty with a strong fungi aroma and a savory and very thick spinach and chickpea patty. Burgreens will omit the cheese on request. You also get two different homemade sauces – garlic with yogurt, seaweed and celery and raw mayonnaise with yellow mustard and coconut. Fruits for dessert? What about a raw strawberry cheesecake? Cashews that have been soaked for three hours form the bottom layer, followed by a sweet, creamy coconut middle and a zingy, tarty strawberry top. 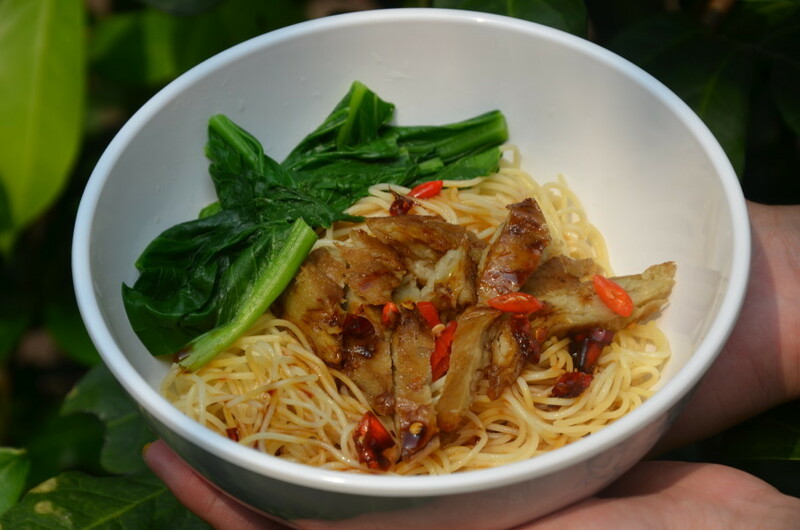 Since this is their fifth year in business, Burgreens' menu is extensive and includes vegan hot dishes such as yamien and cassava aglio olio. Owned by vegan couple Yogen and Diana, iVegan Pizza is the product of months of trial and errors. The couple learned how to cook vegan food on their own, never taking any formal course, since they ended up having to cook at home anyway once they switched to a full vegan diet. The vegan-Italian place serves everything from pizza to risotto. Everything is 100 percent vegan including their desserts. 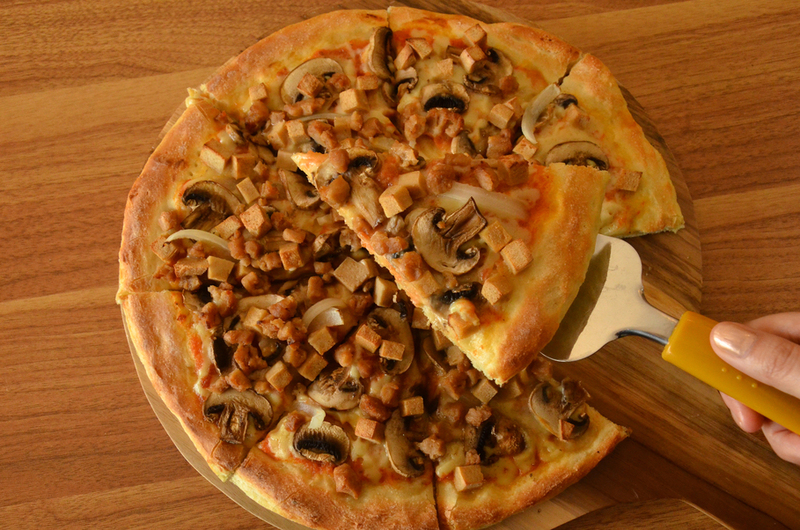 Their pizzas have toppings with funny names, "Cheerful Log" and "Cheerful Chunk" – minced soybeans that are packed and shaped to look like ham or chicken breast. "We make up these names so people don't compare them [to their meat versions], because they're not meat. We don’t want people to come here and imagine meat when eating vegan food. That's just not natural," Yogen said. For that essential Italian ingredient, cheese, the restaurant uses smooth, spreadable homemade soy cheese that tastes like mascarpone (Italian cream cheese). 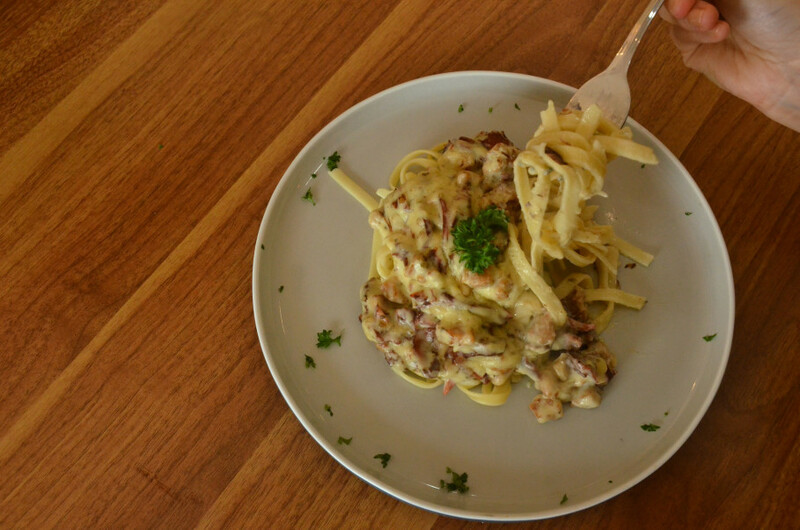 Its fettuccine uses smoked gluten instead of beef. The gluten is chewy, just like beef, and the smoked flavor has some depth to it. "What makes food good is actually the spices it’s mixed with. Meat is actually quite bland," Yogen said. Yogen said if you cook using the same spice blend and a main ingredient with a texture similar to meat, your brain will trick your taste buds into thinking it's real meat. "Try using mushrooms instead of meat the next time you cook," he said. Santi and her daughter Meigha became vegetarians because of her husband, who started following a plant-based lifestyle way back in 1997. All of them are now full-fledged vegans. 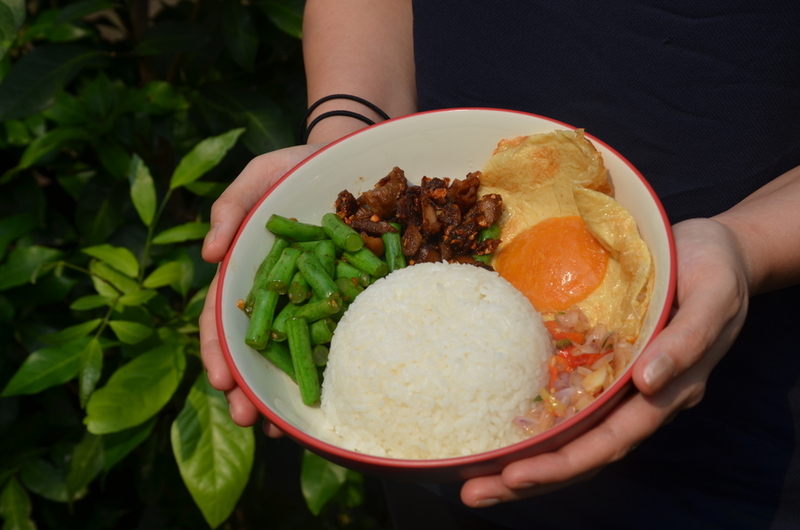 Santi's signature dish is a meatless sambal matah (raw shallot and lemongrass chili) rice bowl with sauteed green beans, savory mushrooms and a vegan egg. The egg white is made of konyaku (a bland jelly made from Japanese yam) and tofu while the egg yolk is a sweet potato mash. When placed in the pan, the sides crackle with the oil, creating a brown outline just like on a real fried egg. Santi also makes mock-duck that looks like it has a layer of skin and fat, but is actually just tofu skin attached to a minced soybean mix. The seasoned protein goes well with soft-grain noodles and fresh vegetables. Even if you're not looking to change your diet any time soon, Feel Good Food's fake meats are worth a try. No dine-in yet but their entire menu is available on Go-Food. Bluezone is a geographical term for five regions where the healthiest people in the world live: Okinawa (Japan), Sardinia (Italy), Nicoya (Costa Rica), Icaria (Greece) and Loma Linda (California). Because of their mostly plant-based diets, Bluezone residents typically live above their local life expectancy and usually die of old age, not sickness. 25-year-old owner Jason said he wants to establish Indonesia's very own Bluezone, stating his first mission as helping to build healthier communities in Jakarta. Jason said one of his main challenges is getting his customers to understand the products he sells. Take Kombucha as an example. A major source of probiotics, this fermented green drink often gets on the wrong foot with beginners. The three-week fermentation process makes the tea sour and fizzy, and gives it an odd smell. "Think of it as Yakult (a popular Japanese probiotic drink) but dairy-free. It's good for people who are lactose intolerant," Jason said. Fresh fruits can be added in the secondary fermentation process, providing all natural flavors with no added sugars. 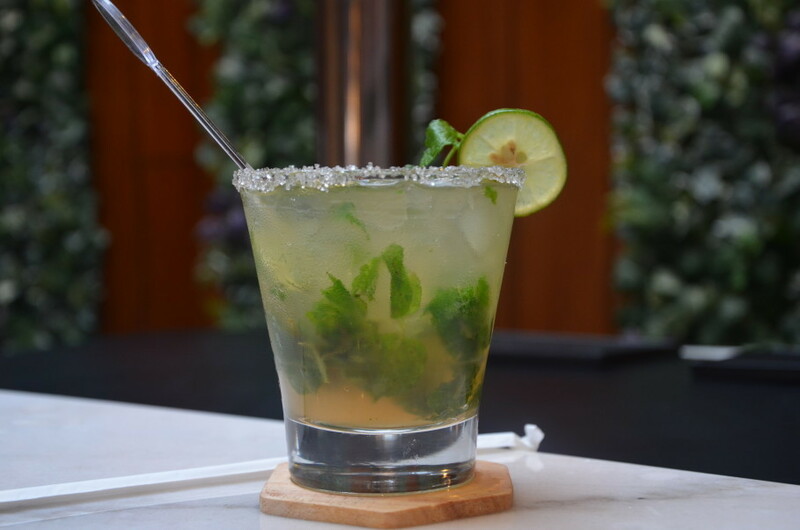 The tart drink also helps with bloating, gastric problems, digestive issues and constipation. Bluezone is the only place in Jakarta where you can get Kombucha on tap because all of their Kombucha is homemade on site. "We started brewing our own kombucha at home because we couldn't find it in Indonesia," Jason said. "I even had to build my own Kombucha tap because they didn't sell them here." All the dishes in Bluezone are 100 percent vegetarian. They also have vegan alternatives. Their vegan bakso (normally finely ground beef balls) are made with a minced mushroom and edamame peas mix. They're chewy and some bites feel tendon-y, just like real Indonesian meatballs. 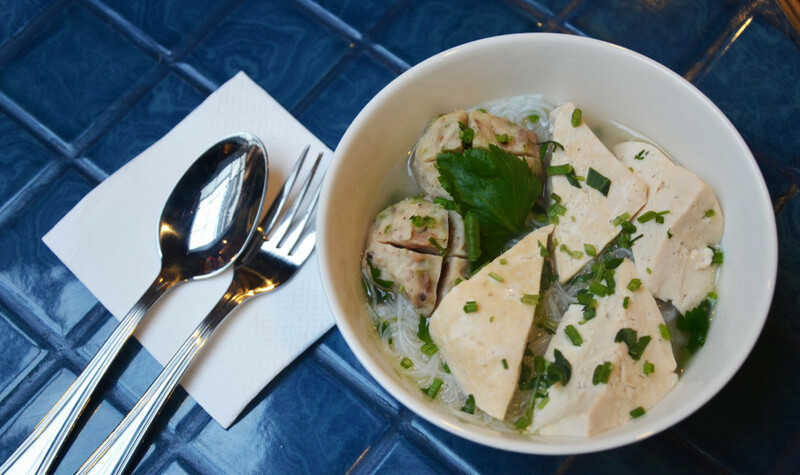 They're served, along with soft tofus and silky rice noodles, in a hearty vegetable and mushroom broth. Bluezone also has a vegan rendang bowl with a medley of vegetables. Don't be fooled, nothing in this bowl has meat. The rendang, normally a spicy, slow-cooked meat curry, is made up of chopped up portobello mushroom stems which are then cooked with a spice paste and almond milk mixture. 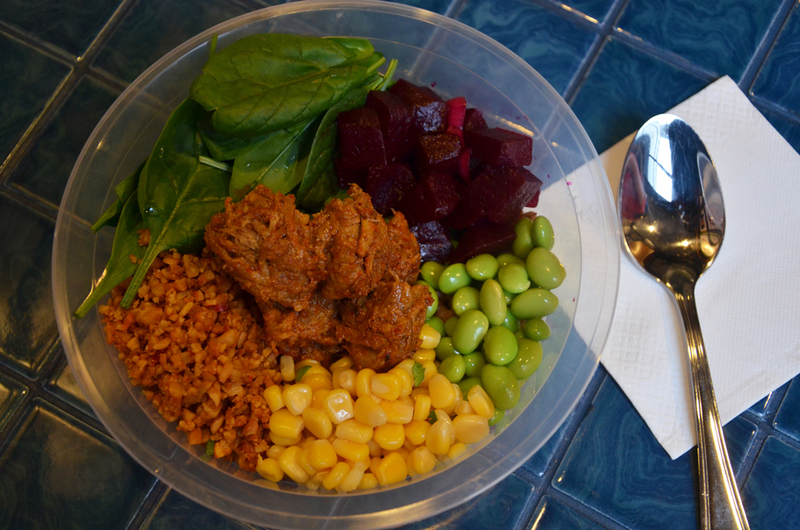 It comes accompanied with homemade pickled beets that add a sweetness to the spicy sauce, crunchy tempe, red rice and raw corn, edamame peas and baby spinach leaves. Besides healthy rice bowls and drinks, Bluezone also serves up Acai smoothie bowls, vegan bread and cold-pressed juices.